Monday evening was perfect grilling weather. It was warm, but not hot, sunny and dry with a gentle breeze. Plus, Matt arrived home just as I was headed down stairs with a tray of food, so I had the pleasure of his company while I tended the grill. Then disaster struck. While flipping a piece of tofu with a pair of tongs, I lost my grip and it landed on the ground at my feet. I looked at the sad, dirt covered tofu, looked at Matt, then back at the tofu. I pouted. “Five second rule. Pick it up,” he said. And so I did. In case you’re thinking, “That’s what you get for grilling tofu. What sacrilege! Cooking processed soy bean product on what is essentially a sizzling altar to meat,” bear with me. First, I had to perform a little surgery, cutting off the gritty, dirty bits of tofu. 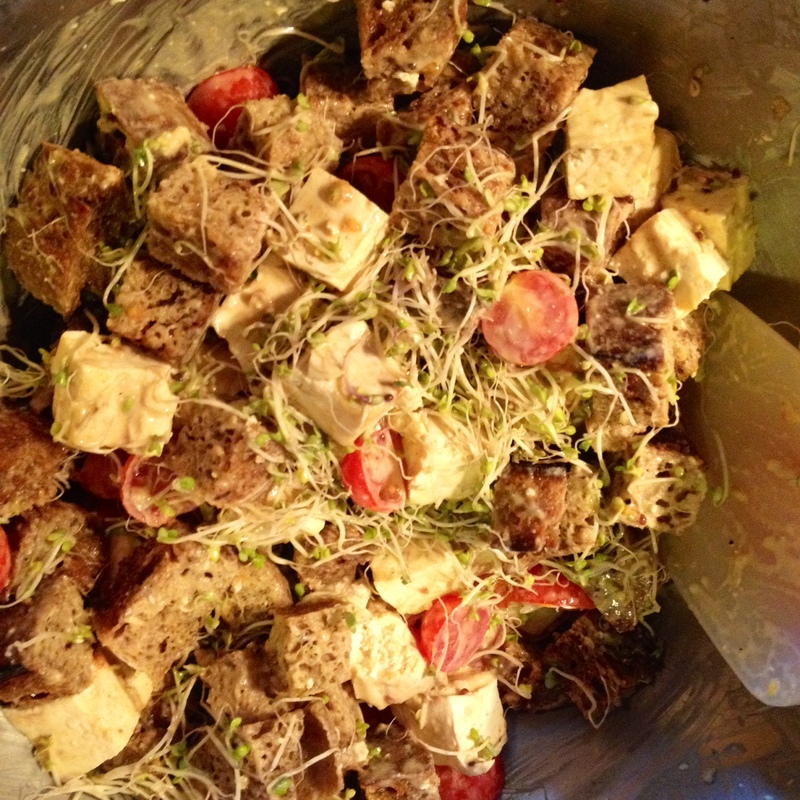 Then I cubed it and tossed the tofu with bread (also grilled), tomatoes, sprouts, and a peanut sesame oil dressing. Strange, I know. My father was a meticulous chef. His mise en place was arranged in appropriately sized Pyrex bowls. He patiently waited for the pan to come to exactly the right temperature. He timed all the various components of the meal to be ready at exactly the same time. So, it’s hard for me to imagine him having to save grilled food off the ground. And yet, even my dad had his cooking Kryptonite – grilled chicken. Every time without fail,beautifully fresh chicken parts went on the grill and terribly charred chicken bits would come off. But if you were brave enough to tackle the blackened skin, there was invariably some awesomely juicy and flavorful morsel of chicken meat underneath. I kept this in mind while I prepared this strange grilled tofu experiment. The sprouts made it look furry. The char marks made it look gritty, but the smell of peanut and sesame made it strangely enticing nonetheless. And just in case it was completely awful (and just in case my carnivorous friends had lost faith in me), I threw some lamb chops marinated in day old pesto on the grill too. When we finally filled our plates and dug into the meal, that furry tofu bread that looked and sounded so strange and maybe a little crazy, was absolutely delicious – the best thing on the plate. So, I declared a grilling victory, despite the mishap, while Matt happily ate seconds and polished off the leftovers the next night. and start to carmelize. (This step can be done beforehand and kept refrigerated). golden and crunchy. Tear the bread into bite size chunks. into ½ inch pieces and place in a large bowl. hot water (varies depending on the consistency you want your dressing). it gently – it will look overdressed at this point. Add the bread and toss again. 6. Turn tofu mixture out onto a platter, top with tomatoes and sprouts. 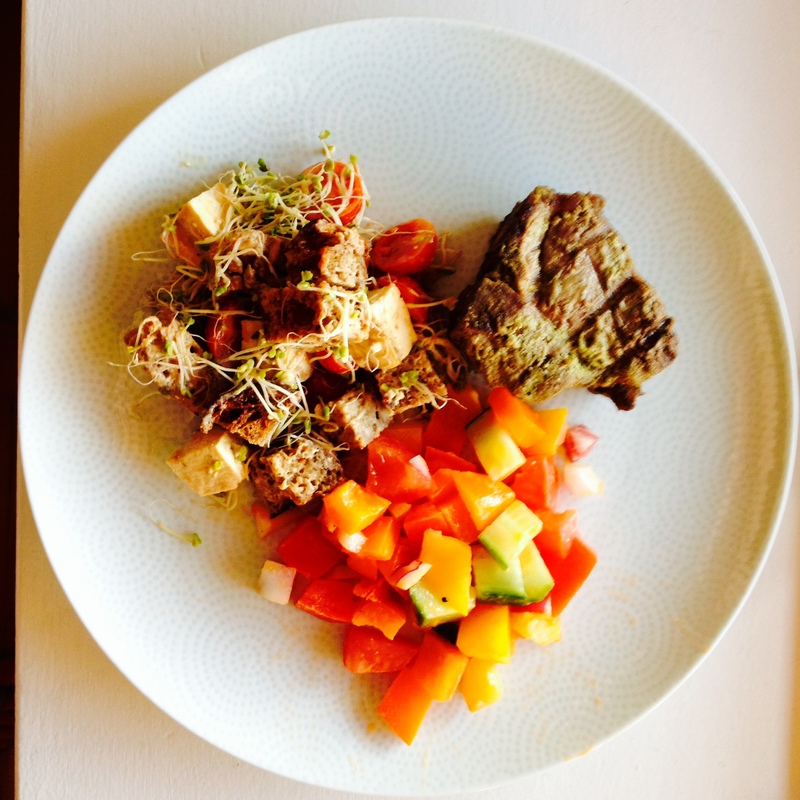 Tags: grilling, recipes | Permalink. This dish really was delicious, notwithstanding my unsanitary cooking advice. I think that grilled bread really sealed the deal, but the combination of tomato, tofu, and peanut sauce was excellent.